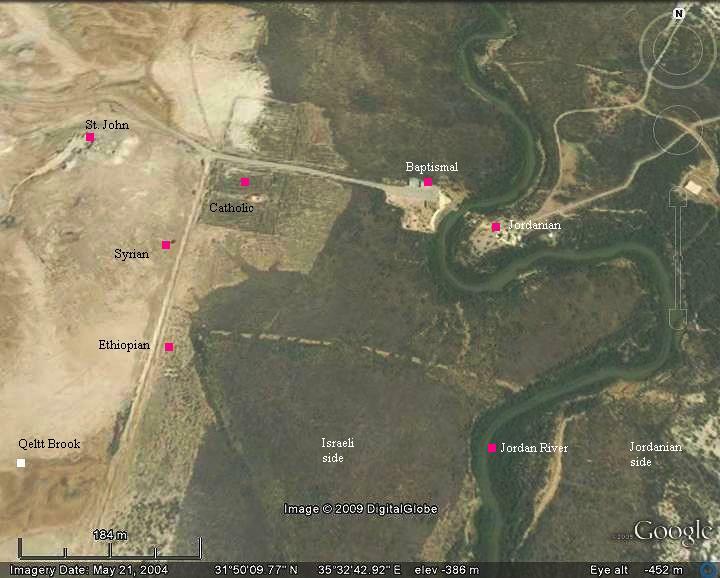 John 1 28: "These things were done in Bethabara beyond Jordan, where John was baptizing". 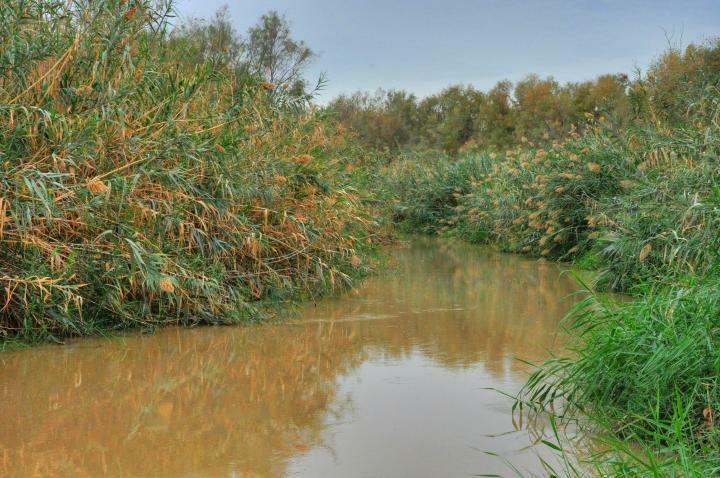 The southern side of the Jordan river, before it flows into the Dead Sea, is the Jericho section. 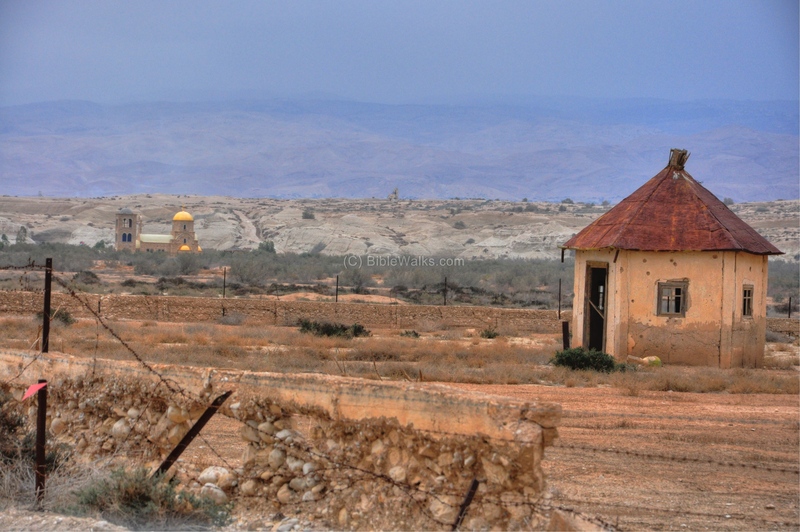 At this location, on the border between Israel and Jordan, are a number of points of interest: the traditional site of the crossing of the Jordan by the Israelites, the departure of Elijah on a chariot of fire, the pilgrimage site of John's baptize of Jesus, and many monasteries and chapels of various Christian orders. The aerial map of the area is shown below, indicating the major sites. 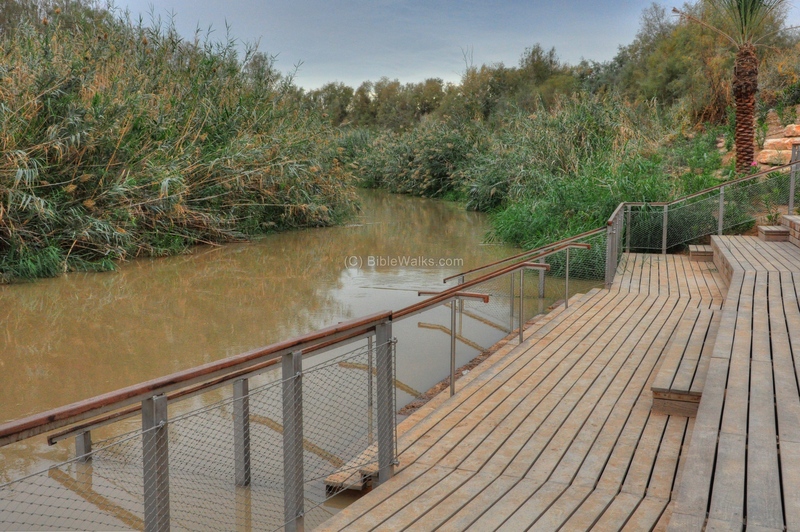 The Jordan river flows between Israel (left side) and Jordan (right side), in a winding. 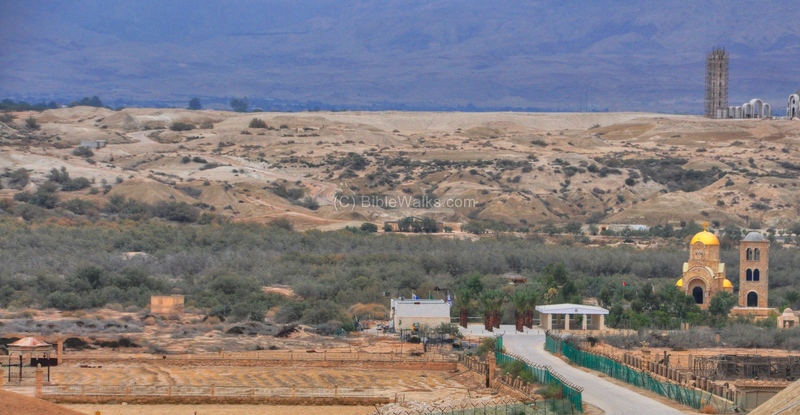 It is located at a height of -375m (under sea level), 9KM east to Jericho, 7KM north of the Dead Sea. You can point on the purple points to navigate to the selected site. 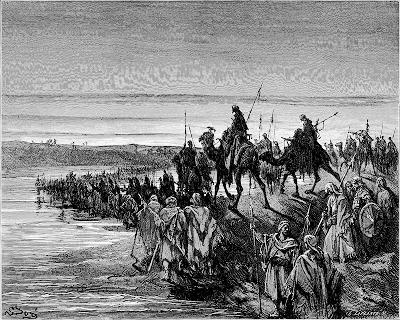 According to some traditions, the Israelites crossed the Jordan at this location on their return from the exile in Egypt. The site is loacted "against Jericho" as described in the following verses ( Joshua 3 9-17): "And Joshua said unto the children of Israel, Come hither, and hear the words of the LORD your God.... Behold, the ark of the covenant of the LORD of all the earth passeth over before you into Jordan. And it came to pass, when the people removed from their tents, to pass over Jordan, and the priests bearing the ark of the covenant before the people;"
" And as they that bare the ark were come unto Jordan, and the feet of the priests that bare the ark were dipped in the brim of the water, (for Jordan overfloweth all his banks all the time of harvest,) That the waters which came down from above stood and rose up upon an heap very far from the city Adam, that is beside Zaretan: and those that came down toward the sea of the plain, even the salt sea, failed, and were cut off: and the people passed over right against Jericho. And the priests that bare the ark of the covenant of the LORD stood firm on dry ground in the midst of Jordan, and all the Israelites passed over on dry ground, until all the people were passed clean over Jordan". Elijah departs on Chariot of fire - Stella Maris, Carmel Another Biblical event that happened at this location was the departure of Elijah on the chariot of fire, an event that occurred on the Jordan river near Jericho. 2 King 2: "...So they came to Jericho... and they two stood by Jordan.... and Elijah went up by a whirlwind into heaven". A Roman road connected the site to Jericho, and was part of the road systems that connected Jordan to Israel. Traces of the road can be seen on the north side of the road from Jericho. According to Christian tradition, the baptism site of Jesus by John was performed at this place. 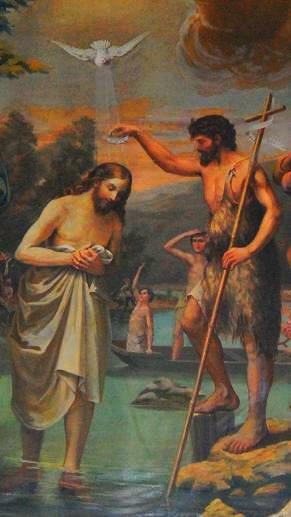 (John 1 28): "These things were done in Bethabara beyond Jordan, where John was baptizing". Since this event was a turning point in Jesus life and eventually the birth of Christianity, this site has an enormous importance for pilgrims and the church. During the Byzantine period, many pilgrims flocked to the site to get blessed and visit the holy site. 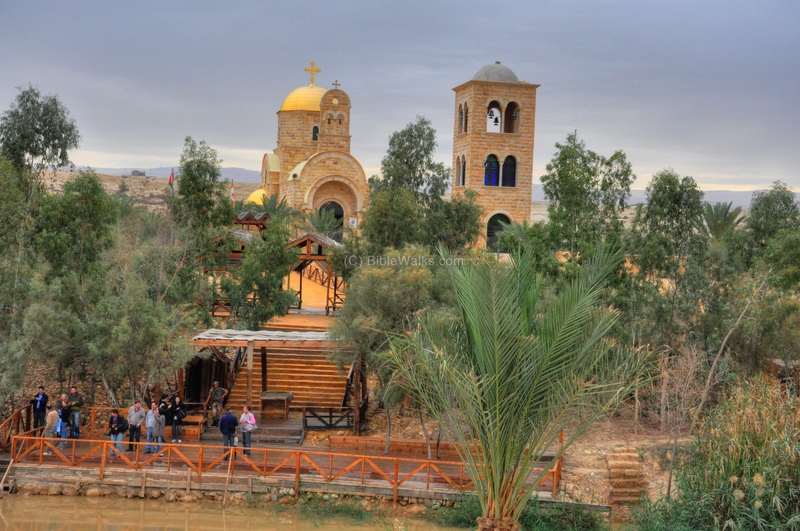 To support this pilgrimage, a Byzantine Monastery was constructed in the 4th C AD at a site overlooking the Jordan river, on the location of later St. John. The monastery was destroyed after the fall of the Byzantine empire in the 7th-8th C.
During the Crusaders period (12-13th C), the Christian pilgrimage resumed. The monastery of St John was rebuilt (1128) on top of the earlier Byzantine structure. A number of monasteries and chapels were constructed near the baptism site in order to support the arrival of a new wave of Christian pilgrims that flocked to the site starting at the 19th C. Almost every order which had presence in Jerusalem - Catholic, Coptic, Russian, Ethiopian - had its own chapel built here. The monastery of St John was severely damaged in the earthquake of 1927 and repaired. In 1954 the structure was expanded and rebuilt. After the six-day war (1967), Israel's border with Jordan passes along the Jordan. The area around the baptismal site is located inside the military zone, and was out of limit. Following the Pope's visit in 2000 the site was partially opened for pilgrims. On Easter the site is also opened to the public for several days under controlled restrictions. On the Israeli side, the army now allows pre-scheduled visits but accompanied with soldiers. A new visitors center is built on the banks of the Jordan river, but its opening is pending a mutual agreement with the Jordanians. 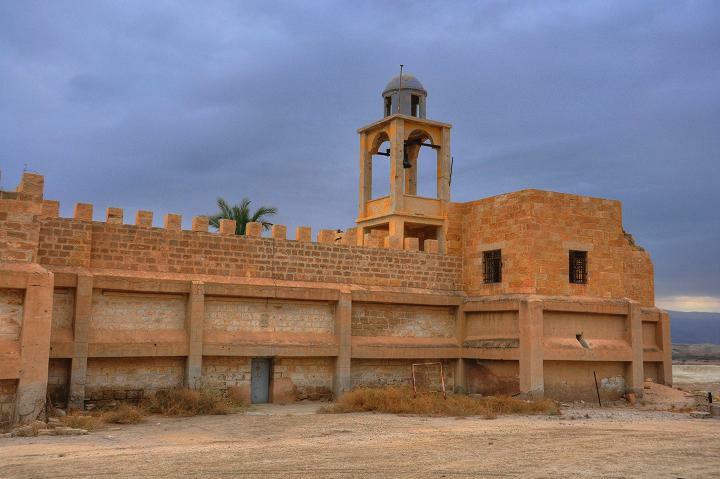 On the Jordanian side ("Beitabara") the pilgrims can enter to the river side from the new Greek-Orthodox church. 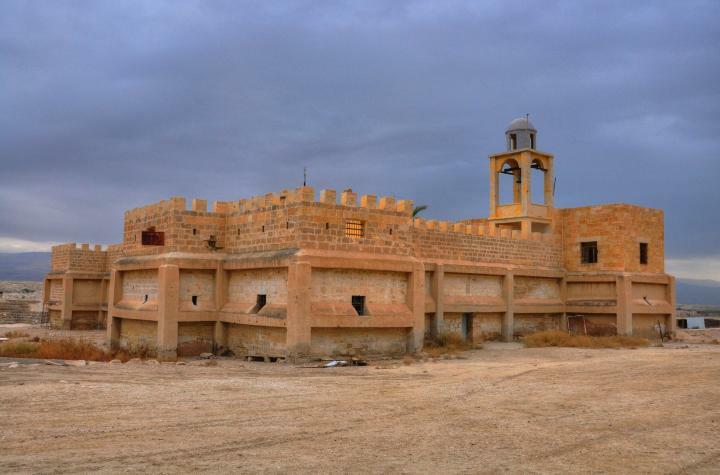 Recently, four new monasteries and churches are in the process of construction. 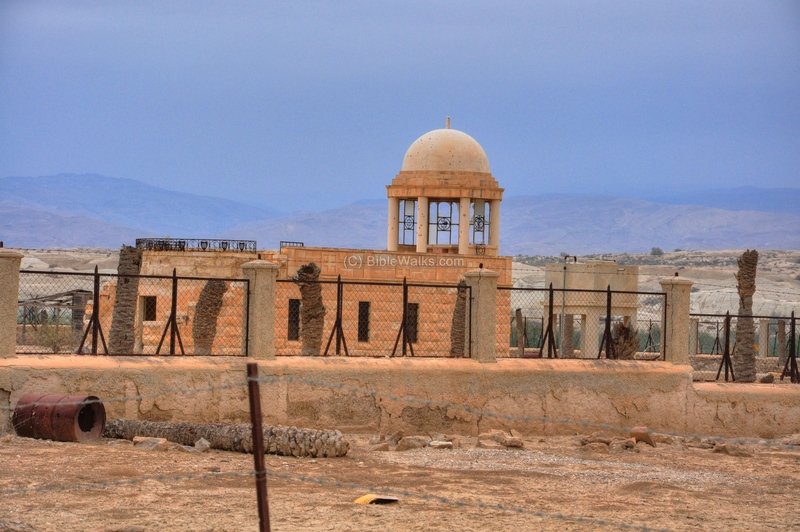 Ancient baptism sites were excavated on the eastern bank of the Jordan. 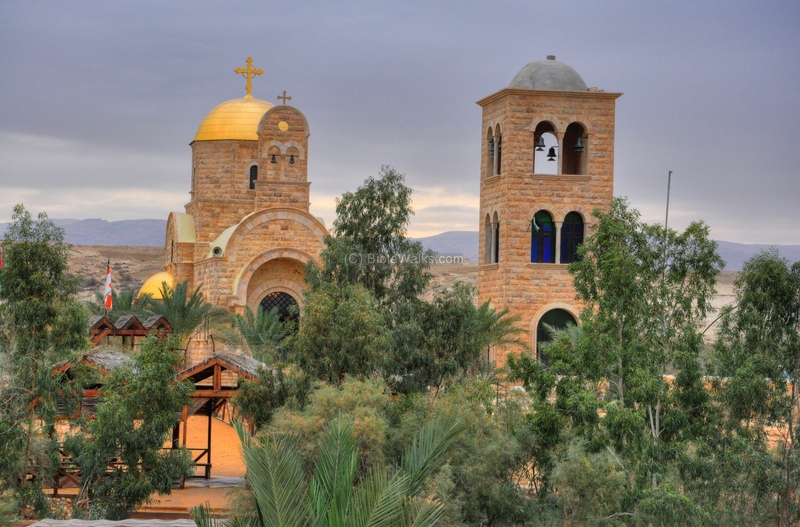 The bell tower of the Greek Orthodox church on the eastern bank of the Jordan river is shown below. In the background are the mountains of Jordan, where Moses remained to die before the crossing of the returning Israelites to the Holy Land. The photo below shows another view of the area of baptism. On the right side, just along the river, is the Golden cape of the Greek Orthodox church and its bell tower. Behind it are new churches constructed on the Jordanian side. In the center, a new visitor center constructed on the Israeli side. On the bottom left side is a Franciscan chapel. 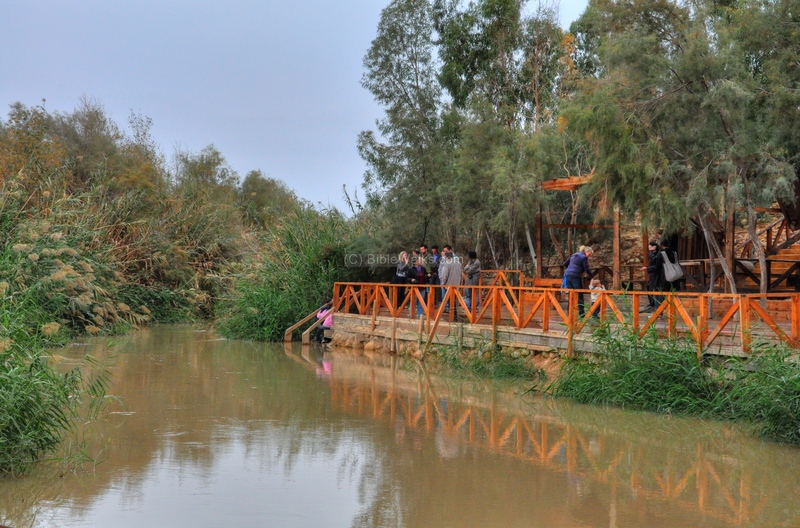 The photo below shows the Jordanian side of the place of baptism. In the photo below - the Golden cape of the Greek Orthodox church (left) and its bell tower (right) are seen behind the baptism site. The distance between the Jordanian side and the Israeli side are a few meters, and only the narrow open river departs both sides. Steps lead down to the river in order to allow the pilgrims to immerse (be baptized) in the Holy waters. The Jordan river at this location is very narrow and its waters are muddy. After most of the river was cut off from its sources and the outlet of the Jordan from the sea of Galilee was blocked by a dam, the Jordan river became smaller and almost dry. On the Israeli side is a new baptism center, which is currently in use only in a few days a year. 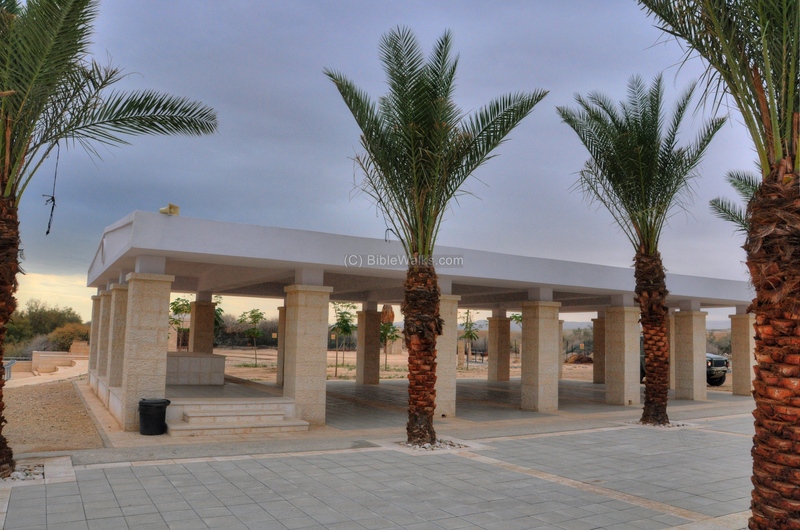 The new modern baptism site, seen below, is planned to be opened to the public after the security arrangements are finalized with the Jordanians. 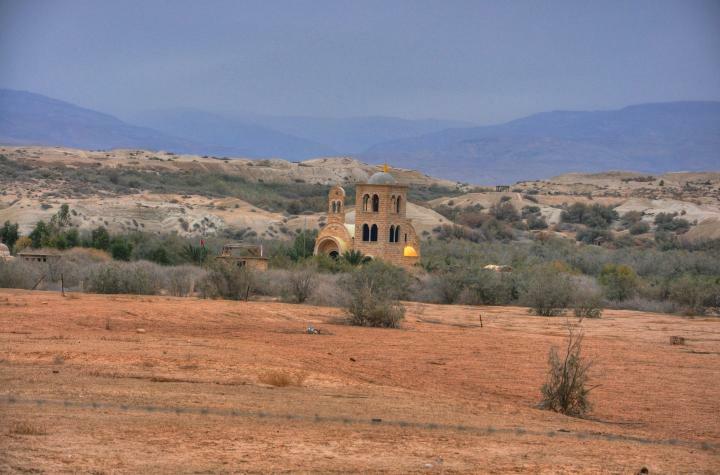 Around the baptism site, on the Israeli side, are a number of small monasteries. 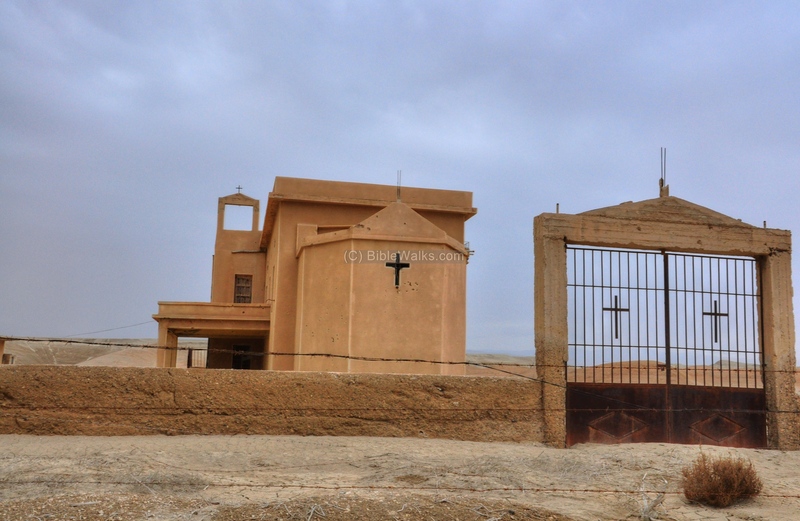 These monasteries are the lowest in the world: -375m (under sea level), and serviced the different Christian orders. They are located on the south-east side of Greek-Orthodox monastery of St John. 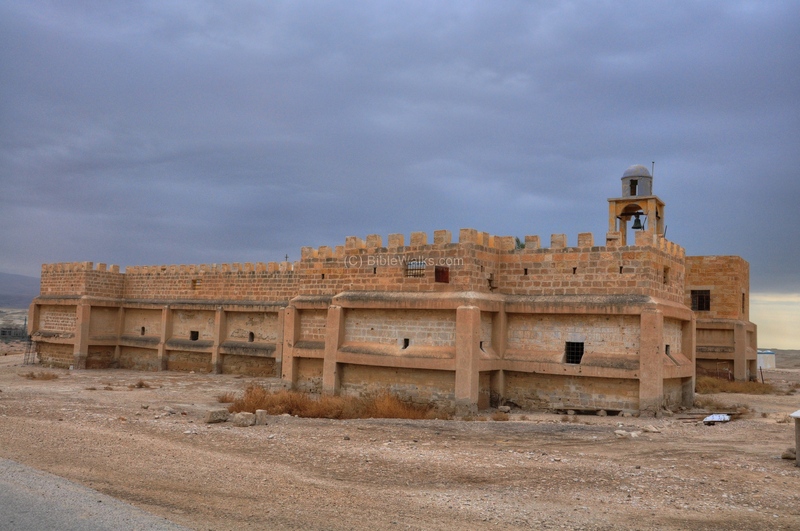 These structures include: a number of Franciscan Catholic chapels (they are the closest to the river); a Syrian-Orthodox church (south of the baptismal site); an Ethiopian (Abyssinian) monastery (south of the site); a Coptic (Egyptian) monastery; a Romanian church and a Russian chapel (the south most). All of them are closed and partially ruined. Due to past incidents, where terrorists crossed the Jordan and hid inside these structures, the army fenced them off and mined them. The entrance to the Syrian Orthodox monastery is seen below. Its apse - behind the cross - is directed to the east as all churches. The Ethiopian Abyssinian monastery is located on the south-east side. 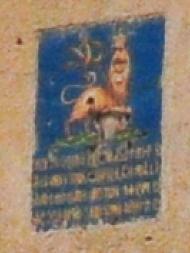 The emblem posted on its north wall (detail is on the right) is the crowned lion of Judah - an icon which represents the Royal Ethiopian family and the emperor. As seen below, the monastery is damaged and sealed. It was hit by bullet holes and mortar fire, fenced off by barbed wire, and mined (the orange triangle on the yellow sign reads "Danger mines" in three languages). Franciscan Catholic chapels are located close to the baptismal site. 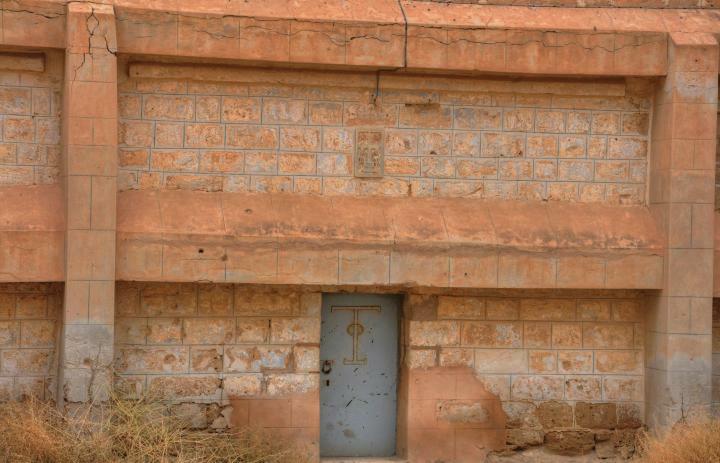 A small prayer chapel is located on the south side of the compound, also mined. This Greek-Orthodox church, located on a hill above the baptismal site, is named after John the Baptist, who baptized Jesus in the Jordan (Matthew 3: 13 : "Then Jesus came from Galilee to the Jordan to be baptized by John"). The early Byzantine Monastery was constructed here in the 4th C AD, but only few remains survived. During the Crusaders period, the monastery was rebuilt (1128). It was damaged in the earthquake of 1927 and repaired. In 1954 the structure was expanded and rebuilt. 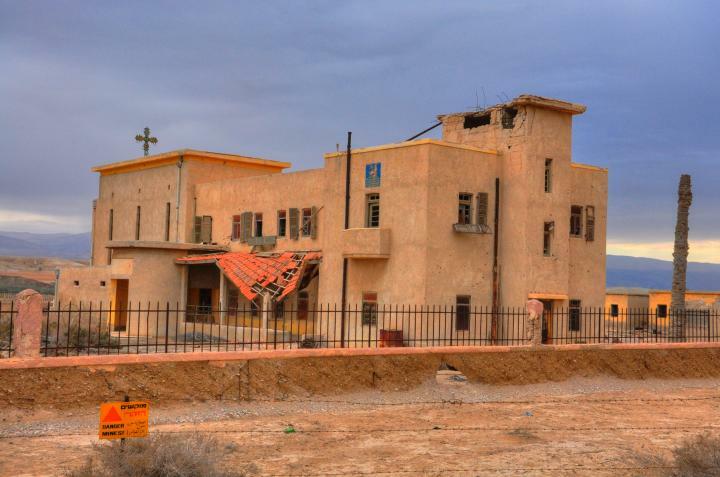 Since 1967 the Monastery is closed. The west side is shown below, with a closer view of its bell tower. The rear entrance to the monastery, which looks like a fortress, is shown below. A detail of the tablet above the entrance is shown below. 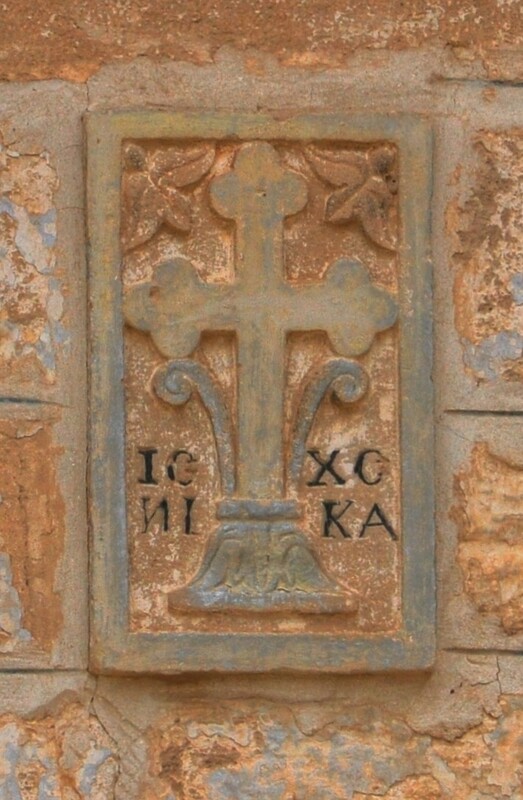 The Greek initials ICXC NIKA stands for "Jesus Christ conquers". 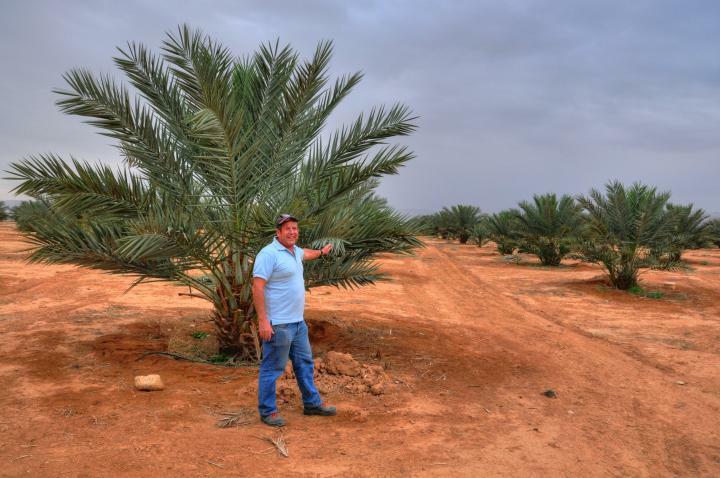 To the west of the site are large palm plantations. The area around Jericho is famous for its palm trees and dates, and the Bible always adds the suffix of "city of palms" to Jericho (for example, Deuteronomy 34 3: ""And the south, and the plain of the valley of Jericho, the city of palm trees"). Doron, a relative of webmaster Rotem who resides in the Jordan valley settlement of Gitit, manages the palms plantation near the entrance to the baptismal site. He - and his wife Adi - coordinated our tours, and were proud to show this wonder of growing trees in the dry and harsh wilderness. 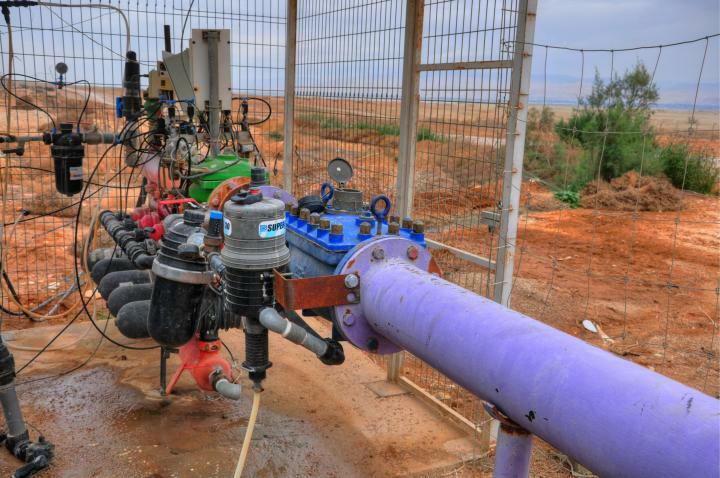 This desert area is very dry and hot, and the Jordan river is also practically dry due to the heavy pumping upstream of the sources of the Jordan. Therefore, the trees are watered by a special pump and filtration system. "And Gideon sent messengers throughout all the hill-country of Ephraim, saying: 'Come down against Midian, and take before them the waters, as far as Beth-barah, and also the Jordan. 'So all the men of Ephraim were gathered together, and took the waters as far as Beth-barah, and also the Jordan." "And Elijah said unto him, Elisha, tarry here, I pray thee; for the LORD hath sent me to Jericho. And he said, As the LORD liveth, and as thy soul liveth, I will not leave thee. So they came to Jericho. And the sons of the prophets that were at Jericho came to Elisha, and said unto him, Knowest thou that the LORD will take away thy master from thy head to day? And he answered, Yea, I know it; hold ye your peace. And Elijah said unto him, Tarry, I pray thee, here; for the LORD hath sent me to Jordan. And he said, As the LORD liveth, and as thy soul liveth, I will not leave thee. And they two went on. And fifty men of the sons of the prophets went, and stood to view afar off: and they two stood by Jordan. And Elijah took his mantle, and wrapped it together, and smote the waters, and they were divided hither and thither, so that they two went over on dry ground. And it came to pass, when they were gone over, that Elijah said unto Elisha, Ask what I shall do for thee, before I be taken away from thee. And Elisha said, I pray thee, let a double portion of thy spirit be upon me. And he said, Thou hast asked a hard thing: nevertheless, if thou see me when I am taken from thee, it shall be so unto thee; but if not, it shall not be so. And it came to pass, as they still went on, and talked, that, behold, there appeared a chariot of fire, and horses of fire, and parted them both asunder; and Elijah went up by a whirlwind into heaven. And Elisha saw it, and he cried, My father, my father, the chariot of Israel, and the horsemen thereof. And he saw him no more: and he took hold of his own clothes, and rent them in two pieces. He took up also the mantle of Elijah that fell from him, and went back, and stood by the bank of Jordan; And he took the mantle of Elijah that fell from him, and smote the waters, and said, Where is the LORD God of Elijah? and when he also had smitten the waters, they parted hither and thither: and Elisha went over. And when the sons of the prophets which were to view at Jericho saw him, they said, The spirit of Elijah doth rest on Elisha. And they came to meet him, and bowed themselves to the ground before him. Kaser (Qaser) El Yahud - Arabic: "The Jews' palace". 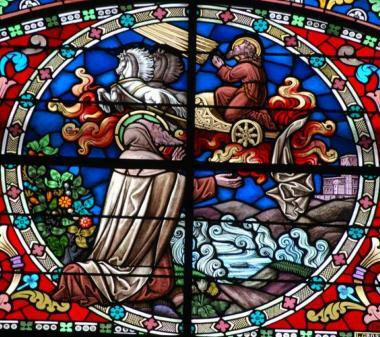 This refers to the St. John's Monastery, and also is the name of the entire baptismal area. Why Jews? According to tradition, this was the crossing place of the Israelites after returning from the Egyptian exile. Bethabara - In Hebrew this may mean "the house of the crossing" of the river of Jordan.